Imagine warm ocean breezes, shimmering water cascading into a crystalline pool, lush, exotic gardens and tranquil music emanating from every corner your own private oasis. Welcome to Tropical Paradise - an unforgettable departure from the ordinary. Upon entering private gates, an unparalleled zen-like experience awaits. Lush, private gardens and countless water features enwrap this Balinese-style home in tranquil harmony. Indoor and outdoor spaces meld seamlessly, complemented by the use of natural fabrics, earth tones, rich artwork and colorful hues. A harmonious family getaway or romantic retreat awaits, right in the heart of Montecito. The Living Room, with bamboo beams and fabric wall coverings, centers around the stone fireplace. Through French doors, a private dining Patio sits adjacent to a soothing water feature, where a happy Buddha presides – a perfect romantic space al fresco. With culinary genius in mind, the open Kitchen is fully equipped to create masterpiece meals. Artful bamboo cabinets house a plethora of gourmet tools and professional appliances, earth-friendly cookware and serving pieces make meal time a true pleasure. The Dining Room features a large, distressed Balinese teak table beneath the soft glow of a pagoda lamp. Earthy tones of terra cotta imbue the room with warmth. The Master Bedroom is a calming sanctuary for even the most weary traveler. The queen-sized bed features vibrantly-colored pillows and a luscious duvet from the owner's home bedding line. As with all rooms in this home, indoor and outdoor spaces blend perfectly. French doors open to the backyard terrace, overlooking the stone-lined pool and cascading waterfall. The Master Bathroom features a large walk-in shower and spa tub beneath a stunning custom stone mosaic. An expansive walk-in closet completes the space. Two Guest Bedrooms offer different vantage points to enjoy serene views of your backyard oasis. On the north side, a bright, airy room features a custom platform queen-sized bed with views of the backyard and pool. The intimate setting of the south Guest Bedroom features a twin day bed with trundle. A private-access door leads to a hidden outdoor spa and two showers tucked under tropical palms. A hall bathroom featuring a spacious sunken tub beneath a gorgeous picture window is shared by the Guest Rooms. A Balinese bungalow is artfully tucked into the landscape. 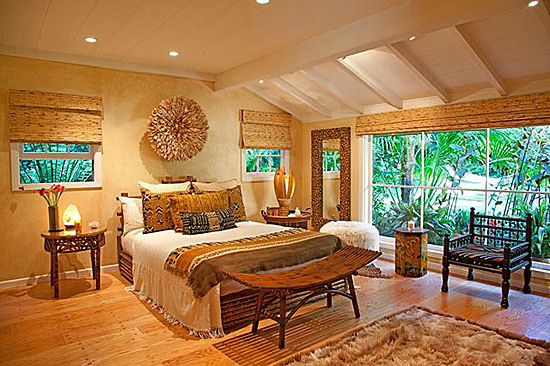 In South Seas style, a queen-size bed rests beneath the Alang Alang thatched roof with walls of windows that, when opened, create the feeling of being suspended among the trees. As with all destinations in paradise, it is time spent in the sunshine or resting in the shade that creates that "endless vacation" feel. A property-wide music system offers guests the opportunity to customize their own backdrop in this magical oasis. A Thai Princess sculpture adorns a tiered fountain that streams into the river rock-lined pool and spa; one feels as if they have stumbled upon a jungle swimming hole. Two thatched roof palapas offer opposing experiences. One is designed for meditation or relaxed outdoor gathering. The other is a private Spinning™ palapa with several Spinning™ bikes and Krankcycles™ to get the blood pumping and body in motion. Yoga mats are thoughtfully provided. As though you were at a fine resort, a plentitude of outdoor seating and chaise lounges connect you to poolside activity. Various dining and seating areas dot the luscious landscape. A large tree shades an informal picnic table and tribal council gas fire pit, creating a festive location for gatherings after dark. Location is the final punctuation to this amazing property, centered between the Upper and Lower Villlages of Montecito and just minutes to local beaches, great shopping and fine dining. The owners have spared no expense, creating an unparalleled private paradise designed to renew body, mind and soul. Bask in the organic comfort of this luxurious oasis. In Balinese, "Om Swastiastu." Welcome!